In the first quarter of the first game of the season, University of British Columbia running back Brandon Deschamps suffered his first concussion. At the time, Mr. Deschamps and his teammates were wearing small sensors behind their ears. Now researchers are hoping data collected from the hit and others like it can some day help diagnose concussions. “When we first heard about it last training camp, I was a little tentative to join because at the beginning you don’t want to think about what you might be doing to your head,” Mr. Deschamps said in an interview Thursday before his team’s weekend game in the national semifinals. The university announced the study Thursday, but it actually kicked off last season. UBC said researchers are studying the impact of hits to the head, and investigating the link between an athlete’s brain function and the number of hits sustained.The issue of concussions in sport, particularly football, has taken heightened urgency in recent years. The National Football League and former players agreed to a $1-billion (U.S.) concussion settlement earlier this year, though the settlement is being appealed because some former athletes say it excludes chronic traumatic encephalopathy – which they call the signature brain disease of football. 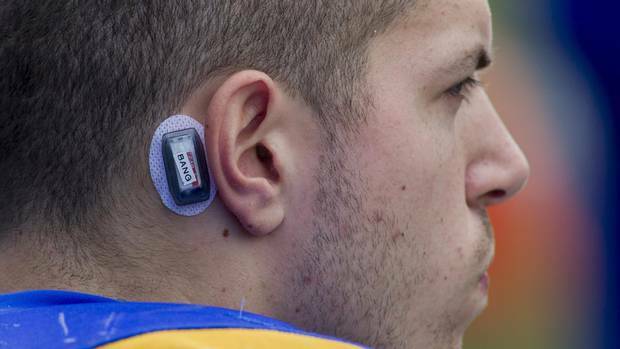 The UBC players, as part of the study, have been taping a sensor known as an xPatch behind their ears. When the sensor is removed, researchers can connect it to a computer and measure both the number of hits and the magnitude of each hit. Jean-Sébastien Blouin, the study’s principal investigator and an associate professor at UBC’s School of Kinesiology, said findings will not be released until the spring. He said he could not disclose medical information about Mr. Deschamps or any individual player, and could not yet reveal how many concussions athletes had suffered over the last two seasons. Mr. Blouin said there’s still considerable work to be done, but researchers are thinking big. “The dream, I guess, for the trainer is to have a sensor that’s going to tell them, ‘Okay, that person has had that kind of hit, you should take them out,’” he said in an interview. Mr. Blouin said the research team’s first paper will look at sensor readings that might have been false positives or false negatives – that is, any readings that might not have been in line with the severity of a hit. Mr. Blouin said the project has been driven in large part by two kinesiology students, Harrison Brown and Alexander Rebchuk. He said players have been upbeat about the project, and the research team has been able to keep the sensors from being too much of a nuisance. “We now have a tape that goes on top [of the sensor]. We cover it back up so it stays there quite well now,” he said. Mr. Deschamps said his sensor has only fallen off once in two seasons. “You don’t feel it at all.” Mr. Deschamps suffered his concussion during the first week of the season and returned to the lineup two weeks later. He said a player can be tentative when returning from such an injury. “That’s in the back of your head when you’re first coming back for that first practice. But then you get right back into it and then you don’t think about it again,” he said. Mr. Deschamps said bad things can happen when an athlete is overthinking. “That’s when you get hurt. … I’m not saying just concussions but other injuries, when you’re playing tentative. Our trainers do a good job of making sure that we’re fully recovered by going through protocol,” he said. Brain injuries have a life changing impact on the lives of the victims and their families. Our team at Graves and Richard Professional Corporation, Personal Injury Lawyers are knowledgeable and experienced in dealing with closed and open head injuries. We understand the severity of these injuries and the challenges the victims face in living with them.